Where Will Obama Eat Next? 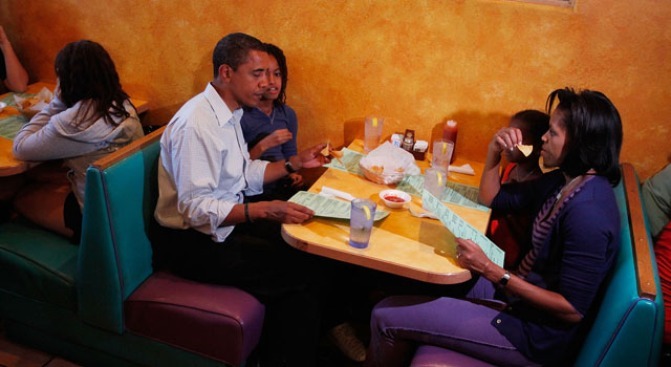 Where in the world are the Obamas eating at in this photo? Hint: It's not in D.C. It started with Ben's Chili Bowl. Then came Ray's Hell Burgers and Five Guys. And now, just yesterday (Saturday), President Barack Obama took his daughters out for some frozen custard at Dairy Godmother. They even bought frozen puppy pops for their dog Bo. Where will the Obama food train stop next? If you have an idea, or a suggestion, send it to us at NBC Washington, subject: Obama's next food stop. Crowds line up outside Ray's Hell Burger as the president and vice president dine.